You are here: Home / News / President Donald Trump and the Israel Test. 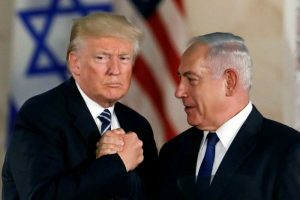 President Donald Trump and the Israel Test. (ThyBlackMan.com) I was privileged to attend the dedication of the new American embassy in Jerusalem on May 14, 2018 — an event of enormous import that will remain with me forever. I am deeply grateful to Ambassador David Friedman and his wife, Tammy, for inviting me to this historic event. The United States recognizing Jerusalem as Israel’s capital is important not just for the United States and Israel but also for the entire world. We might start thinking about this by considering the unique relationship between these two countries. Regardless of how some choose to think about the United States today, the country’s founding generation was largely Christian men and women. The United States and Israel are different from other nations in that both are defined by a creed and by principles. I would go so far to say that the extraordinary success of both countries springs from these principles. What are the great principles that can be extracted from the Ten Commandments in the Hebrew Bible? Reverence for the Lord, reverence for family, reverence for the sanctity of life, reverence for private property and personal responsibility, and a prohibition of envy. Some surely will say that the United States has strayed so far from these principles that they no longer define the country. But I travel constantly. I have been in every state of the union. And I have met enough of the many millions of Americans that still subscribe to these truths to know they are still very much alive in America. And I also believe that the problems that plagued America in the past, and that plague America today, trace to abandonment of these great truths — these great truths rooted in the Hebrew Bible. I see President Trump’s courageous step forward to lead the United States to be the first nation in the world to recognize Jerusalem as the capital of the State of Israel, and to move the United States Embassy to Jerusalem, as implicit recognition that the common ground on which both nations stand is our shared belief in these great and holy truths. The achievements of the young State of Israel, which celebrates its 70th birthday this year, have been truly awesome. Writer, social philosopher and investor George Gilder wrote a book called “The Israel Test.” What is the Israel Test according to Gilder? He asks the question: How do you react to those who excel you in innovation, in creativity, in wealth? Do you envy them and feel diminished by them? Or do you admire what they have achieved and try to emulate them? Those who say the latter pass the Israel Test. According to Gilder, it is the Israel Test that drives today’s tensions in the Middle East. I would take it a step further and say that it is the Israel Test that drives the tensions in America. Gilder says that those who pass the Israel Test tend to become wealthy and peaceful. Those who fail it tend to become poor and violent. The great principles that join America and Israel are equally true and crucial for all of mankind. Congratulations to President Trump for helping America pass the Israel Test. Now we wait for the other nations of the world. With Arab-Israeli dispute, unsure how to solve this problem, other than hope there can be peace between the Arabs and Jews who live there. Israel was created by stealing land from others who were there before them. The fact that the land was stolen from those who were there before you doesn’t mean that you’re disqualified to live there. But you must treat fairly the people who the land was stolen from. Usually don’t hear (except by some) that Jews don’t have a right to live there because it was stolen from others especially the Palestinians. It is important that the Jewish people who live there must treat fairly the people who Israel stole the land from. There’s almost no excuse to kill a 12 year old kid or any kid, unless a kid is shooting a gun @ you and you shoot back in self-defense. But if you can avoid deadly force to resolve situation, then use the non-deadly ways. If a kid is committing a violent deed, then you must use justified not excess force to end situation. Mission America’s Linda P. Harvey, columnist Dennis Mark Prager and Aaron Marshall Breitbart of the SWC would side with Israel or try to find excuses for Israel. If an Israeli soldier kills a Palestinian child such as a 12 year old girl, they’ll say self-defense even if the 12 year old Palestinian girl was doing nothing wrong. I have talked with Aaron Marshall Breitbart of the SWC and he is against the Palestinians regardless. Other things. I support a woman’s free will to wear the Burka and Hijab, but Mission America’s Linda P. Harvey and Aaron Marshall Breitbart critique the Burka. There are non-Muslim women who wear Burkas and Hijabs just as there are non-Hindu women who wear Saris. If a woman wants to wear a Burka, Hijab or veil on her own free will, then I support a woman’s choice to wear a Burka, Hijab or veil. Some women wear the Burka and Hijab because that is what they find fashionable. Incidentally on a different topic, breastfeeding is normal and a woman must be allowed to breastfeed her baby in public, restaurant, store, etc. peacefully, because breastfeeding is a normal activity. Back to Arab-Israeli dispute, if an Israeli soldier were to let’s say kill a Palestinian baby, an excuse Dennis Mark Prager and Aaron Marshall Breitbart would make is that the Palestinian baby would in future turn out to be a future terrorist. In other words, columnist Dennis Mark Prager and Aaron Marshall Breitbart of the SWC justify killing a baby if the baby is Arab, by making excuses. With Arab-Israeli dispute, I do not know the answer to how to solve this problem, other than hope there can be peace between the Arabs and Jews who live there. Israel was created by stealing land from others who were there before them. The fact that the land was stolen from those who were there before you doesn’t mean that you’re disqualified to live there. But you must treat fairly the people who the land was stolen from. Usually don’t hear (except by some) that Jews don’t have a right to live there because it was stolen from others especially the Palestinians. It is important that the Jewish people who live there must treat fairly the people who Israel stole the land from. There’s no excuse to kill a 12 year old kid or any kid, unless a 12 year old is committing a violent deed and you must use justified not excess force. People like Mission America’s Linda P. Harvey, columnist Dennis Mark Prager and Aaron Marshall Breitbart of the SWC would side with Israel or try to find excuses for Israel. If an Israeli soldier kills a Palestinian child such as a 12 year old girl, they’ll say self-defense even if the 12 year old Palestinian girl was doing nothing wrong. I have talked with Aaron Marshall Breitbart of the SWC and he is against the Palestinians regardless. Other things. I support a woman’s free will to wear the Burka and Hijab, but Mission America’s Linda P. Harvey and Aaron Marshall Breitbart critique the Burka. There are non-Muslim women who wear Burkas and Hijabs just as there are non-Hindu women who wear Saris. If a woman wants to wear a Burka, Hijab or veil on her own free will, then I support a woman’s choice to wear a Burka, Hijab or veil. Some women wear the Burka and Hijab because that is what they find fashionable. Incidentally on a different topic, breastfeeding is normal and a woman must be allowed to breastfeed her baby in public peacefully, because breastfeeding is a normal activity. Back to Arab-Israeli dispute, if an Israeli soldier were to let’s say kill a Palestinian baby, an excuse Dennis Mark Prager and Aaron Marshall Breitbart would make is that the Palestinian baby would in future turn out to be a future terrorist. In other words, columnist Dennis Mark Prager and Aaron Marshall Breitbart of the SWC justify killing a baby if the baby is Arab. United States needs to stay out of the Middle East. Yes, I am against terror attacks and am against a Palestinian killing a 12 year old Jewess girl. It’s 1 thing for soldiers to kill eachother in a declared war, but no excuse for that. But let the Jews and Arabs fight that out. We need to stop going to wars for Israel as though it’s old news, we should not have gone to the 2003 Iraq War. The common argument people make both Christians & those who are pro-Israel (esp. Zionists) is that Jews are God’s chosen people. Christians such as Mission America’s Linda P. Harvey side with Israel regardless as do Aaron Marshall Breitbart and Dennis Mark Prager. People like Mission America’s Linda P. Harvey, columnist Dennis Mark Prager and Aaron Marshall Breitbart would side with Israel or try to find excuses for Israel. If an Israeli soldier kills a Palestinian child such as a 12 year old girl, they’ll say self-defense even if the 12 year old Palestinian girl was doing nothing wrong. People such as Mission America’s Linda P. Harvey, Dennis Mark Prager and Aaron Marshall Breitbart will try to find some excuse to justify taking Palestinian land and even killing Palestinian children. If an Israeli soldier were to let’s say kill a Palestinian baby, an excuse Dennis Mark Prager and Aaron Marshall Breitbart would make is that the Palestinian baby would in future turn out to be a future terrorist. Dennis Mark Prager and Aaron Marshall Breitbart would get offended if you point out the fact that not all Holocaust victims were Anne Franks & both Dennis Mark Prager and Aaron Marshall Breitbart would get offended if you mention the fact that individually, some of the Holocaust victims were horrible people. If you were to see a photo of an Einsatzgruppen shooting a man in a ditch and ask, who the victim was before he was killed ?, Aaron Marshall Breitbart and Dennis Mark Prager would get offended by you asking that especially, if you imply the victim was a horrible person. Yes, it’s wrong to execute without a trial and it’s wrong to put people in concentration camps and ghettoes to be starved and worked to death, shot, etc. But in some cases the Nazis killed bad people and there are cases where the Nazis killed pedophiles in the concentration camps and ghettoes. A broken clock gives you the right time twice a day & out of millions killed by the Nazis, you could find cases where the Nazis killed horrible people. Finally, I didn’t care for the late Israeli PM Golda Meir’s view that Palestinians didn’t have a right to live there, but I liked Golda Meir’s honesty. Golda Meir thought Palestinians had no right to live there no matter how nice they were and that they had to leave. I didn’t like her view, but I liked her honesty. The Rabbi Meir David Kahane and Israeli PM Golda Meir were honest-their view was that even if Palestinians didn’t do anything wrong, that they must leave, because they both believed Jews were God’s chosen people. I liked Golda Meir’s honesty while not liking her view. Most people when they talk about Palestinians say that they’re terrorists, but Golda Meir was honest when she said that she didn’t care if a Palestinian’s nice or bad, that they must leave. 7 Reasons Why Samsung Galaxy S10+ Is Better Than The Mighty Apple iPhone XS Max. 4 Reasons Why A Lot Of Black Churches And Black Pastors Have Sold Out The Interest Of The Black Community. 5 Apple AirPods 2 Tips and Tricks You’ll Wish You Knew Sooner Apple Stans. Four Keys to Great Exercise Results, etc.